Clarence Seward Darrow (April 18, 1857 - March 13, 1938) was an American lawyer and leading member of the American Civil Liberties Union. His opposition to the death penalty and his work against racial inequality furthered the cause of human rights early in the twentieth century. He is best known for defending teen-aged "thrill killers" Leopold and Loeb in their trial for murdering 14 year old Bobby Franks (1924) and for defending John T. Scopes in the so-called "Monkey" Trial (1925) where a dramatic confrontation took place in court between Darrow and fundamentalist Christian William Jennings Bryan. Darrow remains notable for his oratory utilizing the wit, compassion, and agnosticism that marked him as one of the most famous American lawyers and civil libertarians of the twentieth century. Clarence Seward Darrow was born in Kinsman, Ohio, on April 18, 1857, to Amirus and Emily Darrow. Amirus Darrow was a Unitarian minister, but he lost his faith and became an undertaker. Clarence and his seven siblings were brought up agnostic. Ostracized by neighbors for his unconventional views, Amirus Darrow had the perfect opportunity to become a stop on the underground railroad. Clarence absorbed much of the reformist views of politicians such as Horace Greeley and Samuel Tilden and the radical journalist and economist Henry George. 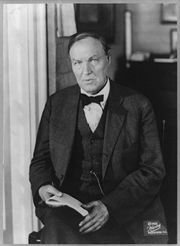 After an education at Allegheny College and one year at the University of Michigan Law School, in 1878, Clarence Darrow became a member of the Ohio bar association. For the next nine years, he was a typical small-town lawyer. Then, in 1887, Darrow moved to Chicago looking for more interesting work. On one of his first cases, he was only paid $15 for a job that lasted for months. But he believed in the cause of defending a poor person against the interests of big business. Often, however, there were heinous issues, such as murder and terrorism. His work became his life, and he became known as the "attorney for the damned." Although he started out idealistic and heroic, by 1911, he had become cynical and, some say, greedy and corrupt. Most of his friends had become offended by the man he had become, and abandoned him, by the time he moved to Los Angeles. His colleagues, poet and former law-partner, Edgar Lee Masters, who authored the Spoon River Anthology, and novelist, Hamlin Garland, complained that he regularly represented big corporations at the expense of the poor workers and pedestrians who were injured, and who were precisely the people he formerly defended. He had such clients as the Kankakee Manufacturing Company, that deliberately defrauded their investors. Darrow's defense in the Kankakee case was excusing the company's fraudulent policies, and arguing that the investors themselves were liable to do their own research. The judge found against the company and advised Darrow to be more mindful to "the Golden Rule." The American Federation of Labor (AFL) chief, Samuel Gompers, and others, asked him to defend the McNamara brothers, to which Darrow reluctantly agreed only after being offered a huge fee and being threatened that, if he refused, labor would not hire him again. When a member of the defense team was caught giving money to a juror, Darrow was brought to court in 1912 on charges of jury tampering. There was little doubt in the minds of those familiar with his previous tactics that he was guilty, and there was substantial evidence to support this. But from the perspective of many previous friends, what was even worse was that he seemed to encourage the McNamara brothers to plead guilty in an effort to save himself. These previous friends felt he had betrayed the cause of labor, socialism, and the left. Gompers came to join the chorus of condemnation. Darrow also betrayed his wife, Ruby, in a long affair with a young socialist reporter named Mary Field. Then, he betrayed Field as well, in an attempt to reconcile with his wife. Both scorned him and he became suicidal. While Darrow defended himself on the second charge of jury tampering, he began to return to life. His oratorical skills came back and he admitted his failings and, in a magnificent closing argument, promised to become a better man. An acquittal was won in the first trial and a hung jury gained in the second. Thus, in 1913, he began to re-invent himself. In one of his most important cases, the Leopold and Loeb trial, he became a champion opposing the death penalty. At 68, he announced his retirement, but he continued to try two of his most significant cases. He took the Scopes Trial and the Ossian Sweet case that same year. Darrow formally retired from practice after that, but was lured back to a few cases, such as the racially-charged 1932 Massie Trial in Hawaii, involving Japanese and white Americans. He died in 1938. In Chicago, Illinois, Darrow soon became a corporate lawyer for the railroad company. His next move was to "cross the tracks," when he switched sides to represent Eugene V. Debs, the leader of the American Railway Union in the Pullman Strike of 1894. Darrow had conscientiously resigned his corporate position in order to represent Debs, making a substantial financial sacrifice in order to do this. Also in 1894, Darrow took on the first murder case of his career, defending Patrick Eugene Prendergast, the "mentally deranged drifter" who had confessed to murdering Carter Harrison, Sr., Chicago mayor. Darrow's insanity defense failed and Prendergast was executed that same year. Among more than fifty defenses in murder cases throughout Darrow's career, the Prendergast case would prove to be the only one resulting in an execution. Darrow was effective as a labor lawyer, representing striking miners in Pennsylvania, revealing the appalling working conditions and use of child labor. He also defended Bill Haywood, the leader of the Industrial Workers of the World and the Western Federation of Miners, who was acquitted of charges of being involved in the murder of former Idaho governor, Frank Steunenberg. In 1911, he took on the defense of the MacNamara brothers. They were charged with dynamiting the Los Angeles Times building, resulting in the deaths of 20 employees. When Darrow was seen standing on a street corner within view of the place where his associate handed over money to one of the jurors of the case, he convinced them to change their plea to guilty and was able to plea bargain prison sentences instead of the death penalty. After representing the MacNamaras, Darrow was charged with two counts of attempting to bribe jurors, although the brothers' guilty pleas meant that the jurors played no part in the case. After two very lengthy trials—in the first, defended by Earl Rogers, he was acquitted; in the second, he defended himself, resulting in a hung jury—Darrow agreed never to practice law again in California and in exchange he would not be retried. A consequence of the bribery charges was that the labor unions dropped Darrow from their list of preferred attorneys. This effectively put Darrow out of business as a labor lawyer, and he switched to criminal cases. Darrow became renowned for moving juries, and even judges, to tears with his eloquence. Throughout his career, Darrow devoted himself to opposing the death penalty, which he felt to be in conflict with humanitarian progress. That all people are equal, that all human beings on the earth, white and black and yellow, men and women, are entitled to the same rights, to perfect social equality, and perfect opportunity, the one with the other. In light of Darrow's record of support for racial justice, it is not surprising that in 1925, the NAACP turned to the nation's most famous defense attorney for help in the highly publicized case of Ossian Sweet's family. In 1924, Darrow took on the case of Nathan Leopold and Richard Loeb, the teenage sons of two wealthy Chicago families, who were accused of kidnapping and killing Bobby Franks, a 14-year old boy, to see what it would be like to commit the ultimate crime. Darrow convinced them to plead guilty and then argued for his clients to receive life in prison rather than the death penalty. I know, Your Honor, that every atom of life in all this universe is bound up together. I know that a pebble cannot be thrown into the ocean without disturbing every drop of water in the sea. I know that every life is inextricably mixed and woven with every other life. I know that every influence, conscious and unconscious, acts and reacts on every living organism, and that no one can fix the blame. I know that all life is a series of infinite chances, which sometimes result one way and sometimes another. I have not the infinite wisdom that can fathom it, neither has any other human brain. Why should this boy's life be bound up with Frederick Nietzsche, who died thirty years ago, insane, in Germany? I don't know. I only know it is. I can think, and only think, your Honor, of taking two boys, one eighteen and the other nineteen, irresponsible, weak, diseased, penning them in a cell, checking off the days and the hours and the minutes, until they will be taken out and hanged. Wouldn't it be a glorious day for Chicago? Wouldn't it be a glorious triumph for the State's Attorney? Wouldn't it be a glorious triumph for justice in this land? Wouldn't it be a glorious illustration of Christianity and kindness and charity? I can picture them, wakened in the gray light of morning, furnished a suit of clothes by the state, led to the scaffold, their feet tied, black caps drawn over their heads, stood on a trap door, the hangman pressing a spring, so that it gives way under them; I can see them fall through space-and-stopped by the rope around their necks. In the end, the judge sentenced Leopold and Loeb to life in prison rather than sending them to be executed. During the trial, when Darrow was believed to have accepted "a million-dollar fee," many ordinary Americans were angered at his apparent betrayal. In truth, Darrow and his two co-counsels were given $40,000 to split three ways after being denied payments for months by the young men's families. In 1925, Darrow joined the ACLU's defense team in the Scopes Trial (known as the famous "Monkey Trial"). The court case tested the Butler Act, passed on March 13, 1925, which forbade the teaching, in any state-funded educational establishment in Tennessee, of "any theory that denies the story of the Divine Creation of man as taught in the Bible, and to teach instead that man has descended from a lower order of animals." The ACLU had decided to use high school science teacher John Scopes, accused of teaching evolutionary theory, as a test case of this law. During the trial, Darrow made the highly unusual request that William Jennings Bryan, the famous Democratic presidential candidate and fundamentalist Christian who was acting as a volunteer counsel for the prosecution, be called to the stand as an expert witness on the Bible. Bryan agreed. His examination of Bryan focused on his interpretation of the Bible as literal truth. Darrow: You have given considerable study to the Bible, haven't you, Mr. Bryan? Bryan: Yes, sir; I have tried to! But, of course, I have studied it more as I have become older than when I was a boy. Darrow: Do you claim then that everything in the Bible should be literally interpreted? Bryan: I believe that everything in the Bible should be accepted as it is given there; some of the Bible is given illustratively. For instance: "Ye are the salt of the earth." I would not insist that man was actually salt, or that he had flesh of salt, but it is used in the sense of salt as saving God's people. It was then that Darrow had made his point-that each person interprets the Bible according to his or her beliefs, knowledge, and so on. Nevertheless, he continued to ask Bryan a string of questions regarding Jonah and the whale, Joshua's making the sun stand still, and the Tower of Babel. By the end of the trial, this string of questions had humiliated Bryan, but also hurt Darrow. Bryan died but six days later. In the end, Darrow's cross examination merely demonstrated that the two men had fundamentally opposing views on religion-Darrow being an agnostic and Bryan a Biblical absolutist and fundamentalist. After about two hours, by which time both men were on their feet shouting at each other, Judge Raulston cut the questioning short, and on the following morning ordered that the whole session (which in any case the jury had not witnessed) be expunged from the record. Scopes was found guilty and ordered to pay a fine of $100. While technically a loss for the ACLU and Darrow, the trial was successful in bringing public attention to the issue. Later, the conviction was overturned on a technicality. The Ossian Sweet case involved a white mob in Detroit that attempted to drive a black family out of the home they had purchased in a white neighborhood. Ossian Sweet was born in Florida, had earned his undergraduate degree from Wilberforce University, and studied medicine at Howard University. He got a job in Detroit's first black hospital, and having saved enough money, he moved his family to an all-white neighborhood. Sweet's house was repeatedly surrounded by white mobs for several days. On September 9, 1925, Leon Breiner, one member of the mob of at least 1,000, was shot dead, and another was injured. The shots were fired from within Sweet's house. All eleven family members in the house were arrested and charged with murder. With assistance from the NAACP, the defense team headed by Darrow showed the jury what the psychology of terrorism was and how the family inside the house was under extreme duress. The jury was advised of the historical impact of such a case, and that this was their opportunity to write history. The first jury was unable to form a verdict after 46 hours of deliberations. No man lived a better life or died a better death than fighting for his home and his children, for himself, and for the eternal principles upon which life depends. Instead of being here under indictment, for murder, they should be honored for the brave stand they made, for their rights and ours. Some day, both white and black, irrespective of color, will honor the memory of these men, whether they are inside prison-walls or outside, and will recognize that they fought not only for themselves, but for every man who wishes to be free! Here were eleven colored men, penned up in the house. Put yourselves in their place. Make yourselves colored for a little while. It won't hurt, you can wash it off. They can't, but you can; just make yourself black men for a little while; long enough, gentlemen, to judge them, and before any of you would want to be judged, you would want your juror to put himself in your place. Henry Sweet was found not guilty, after a deliberation of less than four hours. The prosecution then dropped the charges against the remaining defendants. Clarence Darrow was a sensation of his times, charismatic and forceful in the courtroom. His persuasive powers were well known from his youth in his home town, where he defended positions his ostracized father would champion. The times were full of questions, and the socialist and Marxist thoughts were often played out in the news, and certainly were at the heart of Darrow's earlier career. He loved Voltaire and Tolstoy, and often used poetry in his summations. His oratory has continued to be studied for decades, as extremely effective and moving. In the Debs trial, Darrow established the need to legally represent the poor and issues of injustice. His various labor trials involved the Marxist ideas of his time that violence was a justified response to injustice. In the Scopes trial, he technically lost his case, but Darrow had won the hearts of the eastern intellectuals and such powerful journalists as H.L. Mencken. He became known as an advocate for the constitution in this trial, and it became "foolish" to evoke the Bible or God in "intellectual" society. The colorful phrases used by him and the journalists were to become the legacy of that trial, rather than the issues involved and the fact that the trial itself was actually lost. It is also noteworthy that this was a case of intellectual interest, not personal need, as Scopes himself was asked to become the one who would bring this issue before the court. Darrow became a champion against racial discrimination in the Ossian Sweet trial. He promoted himself as an idealist, yet he had tremendous personal failings. Most felt he was guilty in the charges of bribery, and his reversals in defending the very corporations he previously vilified was very questionable. He also needlessly humiliated another great orator of the day, William Jennings Bryan. When Darrow was dropped from the labor unions, he became bitter. His enormous talent for rhetoric covered any need for diligent study, and he was able to re-invent himself as a notable criminal lawyer. He was mythologized by an innocent public, and they overlooked his transgressions. To something harmonious, even against the schemes of God. ↑ John A. Farrell, Clarence Darrow: Attorney for the Damned (Vintage, 2012, ISBN 978-0767927598). ↑ 2.0 2.1 Doug Linder, Melting hearts of stone. Retrieved October 28, 2009. ↑ 3.0 3.1 Douglas O. Linder, Who Is Clarence Darrow? Retrieved October 28, 2009. ↑ Jonathan Marks, Clarence Darrow Questions William Jennings Bryan at the Scopes Trial. Retrieved October 28, 2009. ↑ Edgar Lee Masters, Clarence Darrow (1922). Retrieved October 28, 2009. Clarence Darrow: 'Attorney for the Damned' - or just another Damned Attorney? Darrow on his childhood excerpt from Farmington, Darrow's 1904 autobiographical novel. The Trial of Bill Haywood Detailed account of the Bill Haywood murder trial. Who Is Clarence Darrow? Douglas O. Linder, 1997. This page was last modified on 24 February 2017, at 21:53.